The Legends aren’t as many heroes down as you may have thought in season 4. Sony confirms Tom Holland’s exclusive leak about Spider-Man: Far From Home. Drew Goddard talks Cloverfield and balancing the drama of X-Force with the comedy of Deadpool. Original Blue Ranger David Yost wants to stage a Power Rangers reunion. Plus, what’s to come on Humans and The 100. Spoilers, away! In a recent interview with Cinema Blend, director Drew Goddard revealed he’ll begin work on X-Force after Bad Times at the El Royale hits theaters. It’s a good question. I’ve learned I’m very much a one-movie-at-a-time kind of guy, and they all know. It’s the same studio, which is nice, so they can say, ‘Okay, get [Bad Times At The El Royale] done,’ and then once I get this movie done and get this into theaters we’ll turn our attention that way. In a separate interview with /Film, Goddard discussed balancing the drama of X-Force with the humor of the Deadpool franchise. The answer is, I don’t worry about the jokes. I just don’t. I worry about the characters, the story, and trust that we’ll make it funny. I did this show The Good Place, and I’ve been very lucky because I work with [creator] Mike Schur and I know, ‘Oh, these are the funniest people on the planet.’ So when I do anything like that, I just worry about the character, the emotion, and the story, and then I go call them and go, ‘Make it funny now!’ With Ryan, the same thing. Ryan Reynolds is so funny. You don’t stress out about it. It’s always easier to add jokes. It’s impossible to add emotion. In the same interview, Goddard confirmed he is not writing or directing the next Cloverfield movie, but “wouldn’t rule out” returning to the franchise at a later date. Speaking with TMZ, Ron Howard described recent reports of Lucasfilm canceling their full roster of Star Wars spinoff films as not “entirely accurate”. I don’t think it’s entirely accurate. I think that was reported, but I don’t think that’s what I understand. Everybody at Lucasfilm and Disney really cares about the fans. I think it’s an ongoing process of discovering what it can be and what it can all add up to. It’s a process, and personally, I like that they take some chances, take some risks and see how people respond to it. Jessica Chastain has begun filming on It: Chapter 2. Jumanji 3 is currently scheduled for a December 13, 2019 release date, according to Dwayne Johnson on Instagram. Bloody-Disgusting has a full gallery of new images; head over there to see the rest. 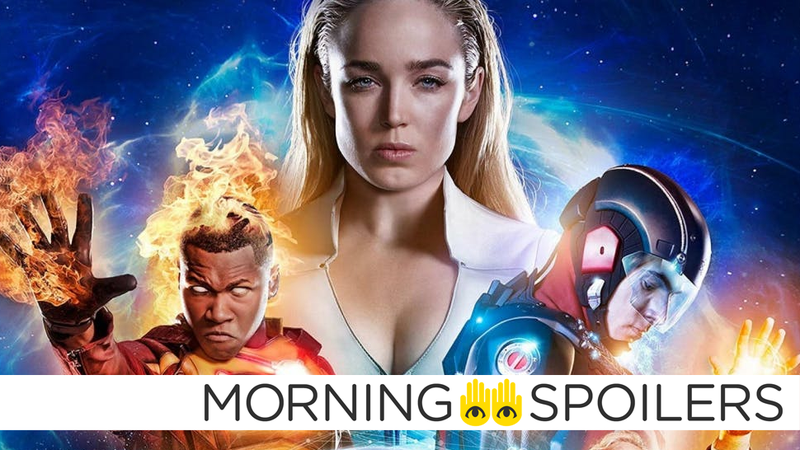 Maisie Richardson-Sellers confirmed that despite her departure at the climax of the previous season, she is indeed returning for Legends of Tomorrow’s “weirder and more wonderful” fourth season. Omega Underground reports Epix could begin filming the Alfred Pennyworth spinoff series this fall. In a recent interview with Comic Book, original Blue Ranger David Yost revealed he’s partially written a Mighty Morphin’ Power Rangers reunion special. Traveling around the world I’m very blessed. I get to travel around the world to different conventions and I meet fans from all over the world and time and time again, all I hear is we want to see a reunion of the original cast. We want to see where the original six, unfortunately only five of us are alive. We want to see where they are at. I’ve never understood why this wasn’t in the plan, or why the people that own the franchise just never really wanted to try that out, but I hear it and hear it. So I would love to be able to give that to our fans. I think that they would really enjoy it. I’ve already written quite specific... I would just say the beginning. I just don’t want to spoil it, so I won’t say anything, but I’ve written it, and it would definitely pay homage to Thuy Trang who played the original Yellow Ranger. And we would still come together and still be superheroes on some level. Deadline reports Krysten Ritter is set to make her directorial debut in a third season episode of Jessica Jones. The season three premiere is titled “Labor Day,” according to Roberto Aguirre-Sacasa on Twitter. Klaus (Joseph Morgan) turns to Davina (guest star Danielle Campbell) for help to learn more about a mysterious affliction affecting Hope (Danielle Rose Russell). On their wedding day, Freya (Riley Voelkel) and Keelin (guest star Christina Moses) make a tough decision about their future together, while Elijah (Daniel Gillies) is forced to confront a past memory of Hayley. Finally, Declan’s (guest star Torrance Coombs) growing curiosity in the city’s supernatural secrets forces Marcel (Charles Michael Davis) to step in. Yusuf Gatewood also stars. Geoff Shotz directed the episode written by Kyle Arrington & Marguerite MacIntyre (#511). Original airdate 7/18/2018. Spoiler TV has images from the July 17 episode “The Warrior’s Will.” Click through to see the rest. Monty (Chris Larkin) strives to show Wonkru an alternative to war, and to the valley itself. Meanwhile, Abby’s (Paige Turco) health continues to deteriorate, along with McCreary’s (guest star William Miller) patience. Eliza Taylor, Bob Morley, Paige Turco, Henry Ian Cusick, Marie Avgeropoulos, Lindsey Morgan, Richard Harmon and Tasya Teles also star. Henry Ian Cusick directed the episode written by Julie Benson & Shawna Benson (#510). Original airdate 7/17/2018. Finally, Laura scores a win for Synth rights in a clip from next week’s episode.